Mexico Is World's Second Most Violent Country, Report Says : The Two-Way Mexico's government is contesting a new international report that says the country's drug cartel violence caused 23,000 homicides in 2016 — a level surpassed only by Syria. 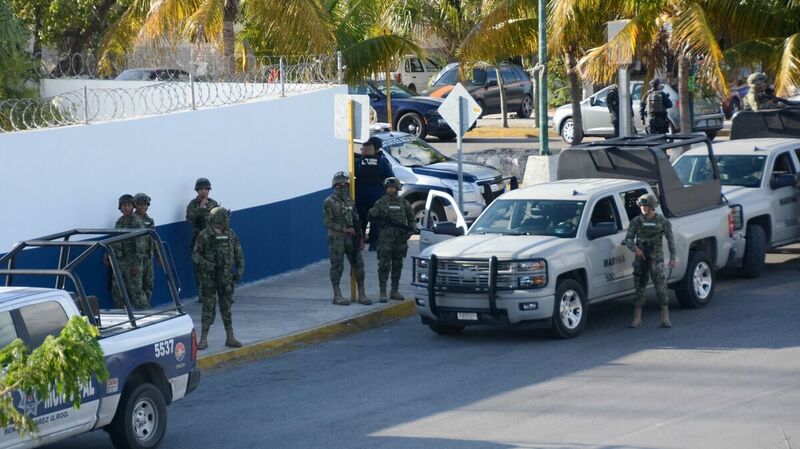 Mexican marines arrive after an attack against the building of the Quintana Roo State Prosecution in Cancun earlier this year. A new report on armed conflicts included Mexico's drug cartel violence in its rankings. Mexico's government is contesting a new international report that says the country had 23,000 homicides in 2016 — a level surpassed only by Syria. The International Institute for Strategic Studies says that intense violence fueled by Mexico's drug cartels has reached the level of an armed conflict. "The annual survey's lead investigator says Mexico's second-place ranking was surprising, considering the deaths are nearly all attributable to small arms," NPR's Carrie Kahn reports, "and not tanks or aircraft fire as in the political wars of Syria or Iraq." News of the report has made headlines in Mexico, a country that can boast the world's 15th-highest gross domestic product, according to the most recent World Bank tally. On Wednesday, the government questioned the methods of the U.K.-based IISS and its decision to include Mexico in its annual Armed Conflict Survey. In a joint statement, Mexico's secretaries of governance and foreign relations said the report irresponsibly points to the existence of an armed conflict within the country. "This is incorrect," the statement continues. "The existence of criminal groups is not a sufficient criterion to speak of a non-international armed conflict. Neither is the use of the Armed Forces to maintain order in the country's interior." The Mexican agencies also questioned the accuracy of the report's figures and methods, saying the country's homicide rate per capita is far below those of other Latin American countries such as Honduras and Venezuela. "Its conclusions have no basis in the case of Mexico," the agencies said of the report. The government said violence from organized crime extends well beyond Mexico, into its neighbors the U.S., Guatemala and Belize. And it said the armed conflict report had attributed all of Mexico's killings last year to drug cartel violence. In a blog post about its findings in Mexico, IISS cited the use of government forces as one factor in its conclusions; it also blamed the problems on "institutional weakness and pervasive corruption" as well as the complex dynamic in Central America's Northern Triangle, made up of Honduras, Guatemala and El Salvador. The armed conflict report also describes the militarization of Mexico's criminal gangs, which it says has both helped them grow and fueled a recent spike in killings. As Kahn reports, "Mexico's murder rate rose dramatically last year, and 2017 doesn't look much better. The homicide rate for the first three months of this year is the deadliest since the height of the drug war in 2011."